Keynotes will include . . .
What’s on your “learning schedule” on this fine, fine Monday in June? What is a Mentor Text? Are all books mentor texts? Should all books be in the pool of mentor texts? 1. All books that are read aloud to students are NOT, especially for this blog post, considered mentor texts. For this post, I am defining mentor text as that ONE, yes, ONE text that matches the writing genre that I am teaching and that is completly covered in post-its because it is my “Marked – Up Mentor Text”. 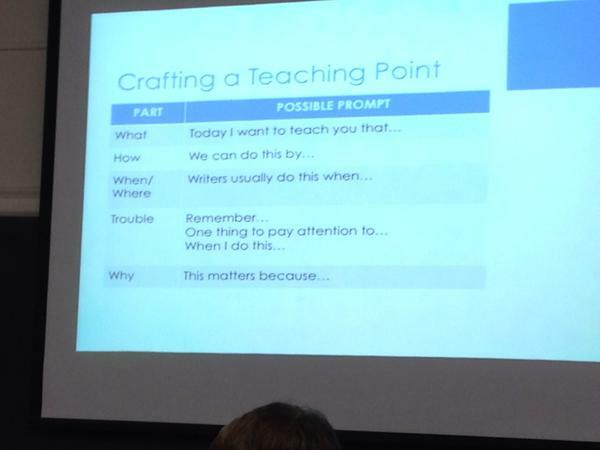 Source: Celena Larkey, June 2015 TCRWP Writing Institute. 2. I am not choosing my most favorite book for my mentor text because I am going to read it OVER and OVER and OVER as we study and write. It has to be a high quality book, but that may not be the newest book. Instead, I am opting for the book that has clear instructional points that works for the writers. 3. I am considering the interests of my students. I am NOT choosing a mentor text because I LOVE it. Instead, I am choosing a book that has content that the students will relate to – be a part of their lives – to increase their own belief in their ability to “write just like this author in this book”. Please, GO read it now! Click on that blue link above. You can always come back by using the “back arrow”! And did you subscribe to the blog so you can continue to read about talk and its power for literacy? Shana’s post was about the qualities that you would discuss when choosing texts and how you might teach this to students. I’ve been asked at least three times to post “lists” of books that we worked with at TCRWP this week. A list does follow. But here’s the “instructional piece” (and yes, I know you HATE when I do that!)! You need to know your students. 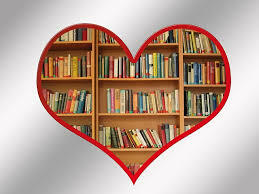 They may not love a book you recommend and ever worse, may not love a book that I love. I work with teachers K- 12. Not all books will be appropriate for all grade levels. I may have left titles off the list because I already own those books. This list began as my “wish list” and is therefore my “wish to purchase” list! All of the trade books that came with the grade level Writing Units of Study. Here is the link at Heinemann to the K pack and you can find the others by grade level as well. What book do you believe should also be on this list? 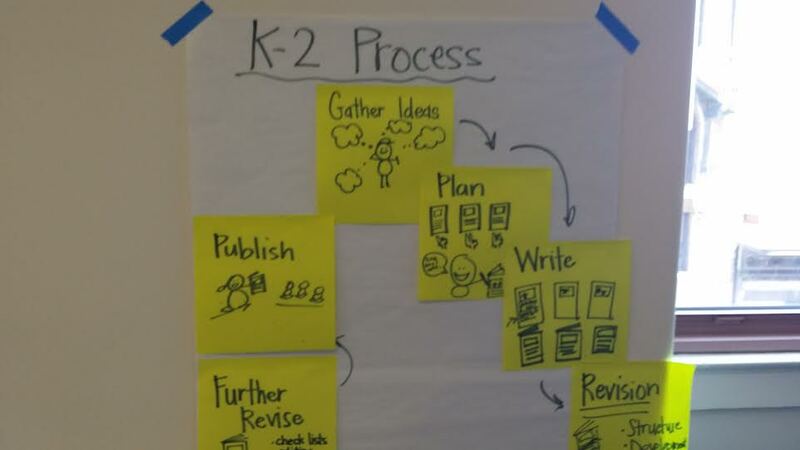 For a lovely recap of the June 2015 TCRWP Writing Institute, please read Tara Smith’s post here because she explains why the images and tweets matter. That intentionality grounded in the question “WHY?” has been a theme reiterated through all the sections, closing workshops and keynotes this week at Teachers College. In other words, if you don’t know “why” you are doing this or “why” you are asking the students to do “x” in workshop, you may need to consider the need for additional reading and / or writing on your own part. Another source of information about the writing institute is always to follow @TCRWP and #TCRWP. You can review the thread for additional charts, photos, and tweets that share out learning from all the masters at TCRWP. We began the week with wise words from Lucy Calkins at Riverside Church and we ended with a celebration that included both wisdom and humor from Sarah Weeks, powerful reading of personal writing from our peers, and closing comments again from Lucy Calkins. As educators, we must continue to be the voice for and of our students. We must also be the readers and writers that we expect our students to be. We must also be the public vision for literacy. But when has life or teaching been about taking the “easy” route? I tried to bring my character to life by using names, details, talking, actions, and inner thinking. I used show not tell to add details. I gave my character a quest or adventure. i gave my character a problem to solve or overcome. i used elements of magic in my story. I chose strong words that would help the reader picture my sotry. I have elements of three in my story. And then we worked with Exemplar Texts. We created our own for our toolkit and we talked about the perameters of student Exemplar texts that may not be error-free but would also be great additions to our toolkit. Kindergarten: 3-4 page story with 3-4 lines of print on each page. First Grade: 5-6 page story with 8-10 lines of print on each page. Second Grade: 5-6 page story with 10-12 lines of print on each page. Are our students writing enough? What does the daily writing volume look like? I continue to go back to this picture. 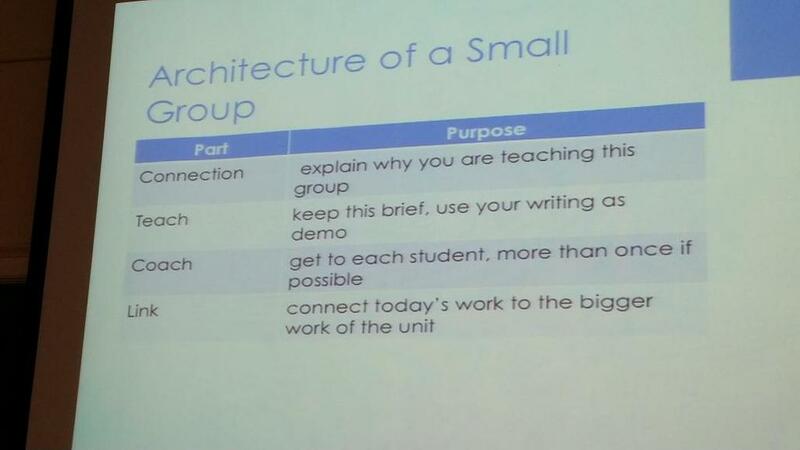 Many folks are adept at small group work and already understand the connection, teach, coach, and link process. But if one returns to the title, the word “ARCHITECTURE” is a deliberate choice. We, in Iowa, love it as we are most known, movie-wise, for “Build it and they will come” in reference to “Field of Dreams”. But architecture conveys that deliberate, planned work that sustains and even lifts up students so they can do the neccessary work. I love that this framework does not say the number of minutes that should be spent; yet I fear the number of minutes spent in group work is not the best use of time for students. Any ten minutes of group work could be ruled productive if students leave writing or better yet, have even already begun the writing demonstrated in the group work. Group work is not all about the teacher talking during the entire session either. Group work is not about the scheculed 30 minutes time on the lesson plan. 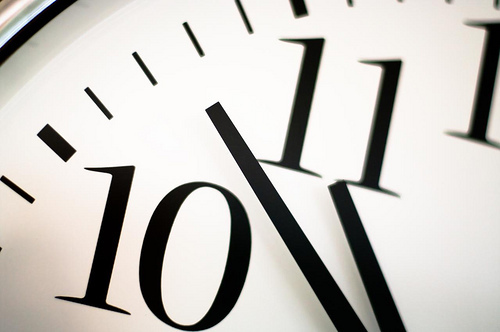 The time that a teacher uses for “talking” takes away from student writing time. The time that a teacher uses for “management” takes aways from student writing time. The time that a teacher does not use for “writing” takes away from student writing time. Small group time could be a waste of time if it does not lead to additional writing volume by the students. Students will not achieve “sky-high” writing without writing TONS! I believe that “writerly” teachers know and understand this. I believe that “writerly’ teachers need to continue to model the many iterations that could show how group work is a short, focused work time for students! After a week of narrative K-2 toolkits and 3-8 Mentor Texts for “Sky-High” Writing, what are your big Ahas? And your continuing questions? This is the third in a series of posts about my learning at the Teachers College June Writing Institute. Day 1 is available here. Day 2 is available here. Goal: Writing drafts using all we know about powerful narrative. Read through the examples in my notebook. Mark one to explore again. Box out a line or phrase to use. Begin with that phrase or line. Close my notebook and then draft. (YES, close the notebook, begin with that small moment and draft AGAIN!) Focusing on this idea of revision will keep students from “recopying when they are in the revision step” of the writing process. Students CANNOT copy when the notebook is closed. 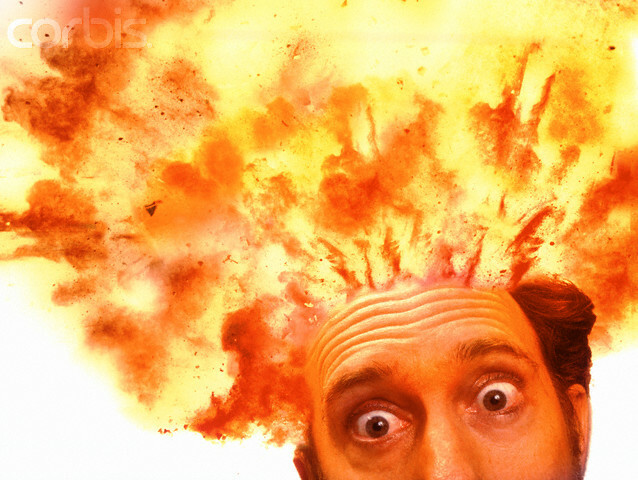 While Writing – Tell a little, draft a little (rinse and repeat) . . . and then find a spot to stop and reread your own writing. Ask yourself, “Am I including conflicting emotions (happy and yet bittersweet moment) that fit my plan for writing?” (If check while writing, development of both flows more evenly.) IF yes, continue on; IF not, go back and add in to your writing NOW. Write on one side of the paper. Use colored drafting paper (Very visible – feels important and very special!). What are you going to do differently in writing workshop? How will you know if it’s working? It’s summer time and it’s time to re-examine your mini-lessons. How effective are they? How do you know? Consider the use of a “Demonstration Sandwich”! Assignment, Repertoire, Managed Choice – The three most important words are “Off you go!” It’s the practice that students need. Remember “under – practiced” from last year! How does this match up to your teaching points? How does this match up to your mini-lessons? What might you consider doing differently? I had a hard time choosing a closing workshop as there were several that I REALLY needed to attend. But last week during a class, we really struggled with defining a thesis so I thought this might be a good place to grow my knowledge. GUESS what? Literary Essays and Raising the Level of Interpretation does NOT have to be BORING!!! So helpful to have some easy and energizing ways to get middle school students (and their teachers) INTO the work. Has the trajectory for literary essay flattened at grade 6 or 7? Do you get a 10 page retell of Harry Potter? Kids have nothing to say about the text. Kids have cliches to say about the text. What fun, easy, and effective way will you use to raise the level of literary essays? Thank you for reading #TCRWP: Day 3 Writing Institute 2015! Share – “Pay it forward” – share with partner so you can have the idea as well. Teacher writing folder is not conferring toolkit. Toolkit is my “wingman” so I can have it if I need it. Even when planning in 2nd grade: Say, sketch, and then Picture, picture, picture. Planning – Make it quick; don’t make it good! Thank you for continuing on . . . Written pieces are the beginning of the process. You do NOT designate a day for gathering ideas, a second day for planning or a third day for writing. And you also don’t learn how to do this in one day and then you are done and you don’t ever do it again. Think about learning something new like “how to shoot a basket.” You, the learner will NEED lots of practice in order to shoot baskets well. Similarly, pieces by beginning writers will not be sophisticated. What is the expected volume of writing for primary students? This should be a focus for primary teachers! Revision (re- vision) want to see it with fresh eyes (or new perspective) so it sometimes means the child is starting over. A student needs to revise on many drafts before moving on in the process. What do K-2 students revise for? Revision can happen on the first day by adding to the picture, a page, or adding on to the ending. At the primary level ADD is synonymous to revision. Students are not really “taking out” much. How does this process match up to the process that your K-2 students use? Where might you begin your study of the writing process? B. What is a “Tiny Topic Journal”? Small Moment writing ideas will be recorded here. When might you consider using a “Tiny Topic Journal”? 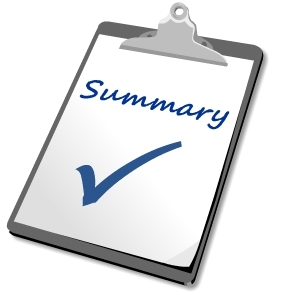 Are your kids writing a summary of their actions? Are your kids just recording information? Are your kids just making a list? You will need to model how you observe life around you and how you pull ideas from “everyday life” to record in your “Tiny Topic Journal”? This could also be to jot down “current” topics for those of us who are older and tend to revert back to “when I was a child” for our small moments. We need to show students how we find ideas as we live our lives. Do you have students who need to work on “observing” life around them for ideas? How would a “Tiny Topic Journal” or “Seed Journal” be helpful? For the purpose of this work this week a Toolkit Text is that one text, “one book that I use”, that I can pull everything from for conferring. It’s not my “model and teach” stack of books. It’s one book that I have marked up with EVERY single thing that I can teach on the page! The stickies stay on the pages! The toolkit Text that Celena shared was Goal! Don’t use your best literature! The table that we are using looks like this and we used Henry and Mudge and the Happy Cat for our mentor text markup. What do we see? What do we call it? Why would we use it? Who else tried it? I would have all these items marked in my book. They would be color coded by: structure, development, and conventions. And because I work with teachers of many grades I would also have those ideas in mind that I would consider using for an author study of Cynthia Rylant with upper elementary students that MIGHT have these additional boxes for this page. The way this looks in my mentor text . . .
Do you have ONE mentor text marked up for your conferring toolkit? 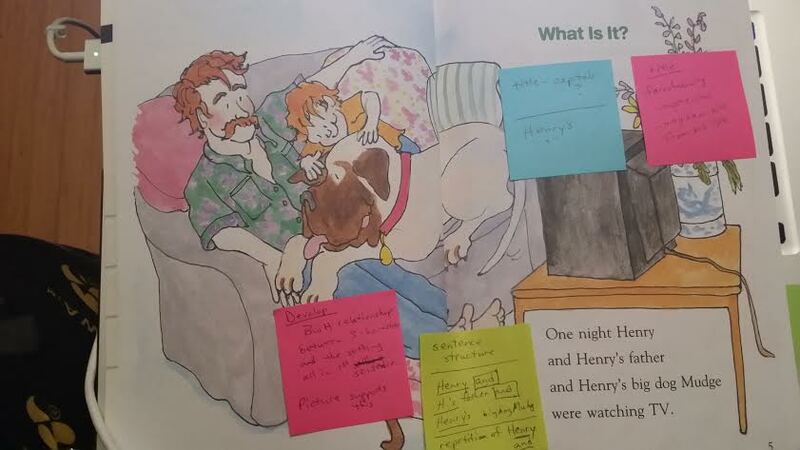 How do you organize your “annotations” in your mentor text? Thanks to Celena Larkey for this awesome learning at the 33rd Writing Institute at TCRWP! Errors in this blog are due to “old ears” and “lack of understanding” – not the fine, fine, fine quality of instruction!